"Seasonable Hints - Dominion Experimental Farms (Canada) - March 1927 - Number 37." 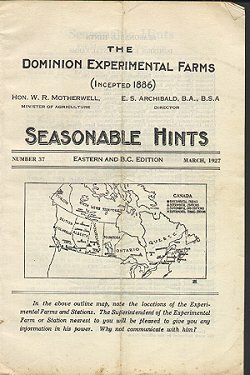 (1489) Seasonable Hints - Dominion Experimental Farms (Canada) - March 1927 - Number 37. -Condition: Good Plus Has been folded to fit in envelope. Informational pamphlet. Cover shows outline map of Canada with the Experimental Farms and Stations marked. Inside information includes: The Farm Tractor, Legume Inoculation, Winter Hardiness of Red Clover, Fertilizers, Care of Brood Sow and more. Also includes an insert of list of new publications for March 1927. Issued for the Eastern and B.C. parts of Canada. Pamphlet measures 6 1/2" by 9 3/4" and has 16 pages. Price: $5.00 + shipping.